Our second morning in camp in Khwai. 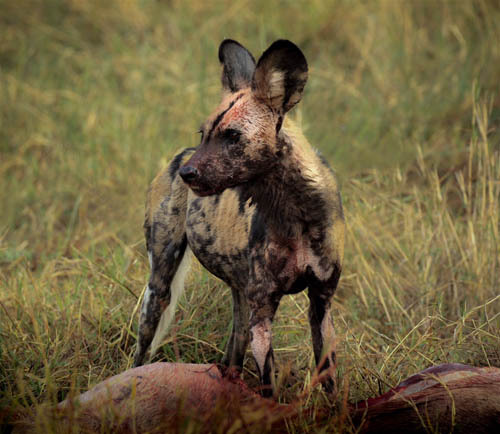 Early breakfast is disrupted by a radio call… a wild dog pack with puppies are spotted close to the camp. Toast is dropped and half-drunk coffee is left on the table as we jump into the Land Cruiser and head quickly out. Missing breakfast is rewarded by watching a pack of ten adult dogs and nine puppies, around three-month’s old, running through the bush. Every few minutes the pack waits for the pups to catch up with a “minder” dutifully shepherding them from behind. I recognise the alpha female from the day before. We had watched her eating an impala that she had brought down alone during the night. Her behaviour as she eats is interesting, always watchful and alert and eventually running off leaving plenty of impala behind for hyenas and vultures. 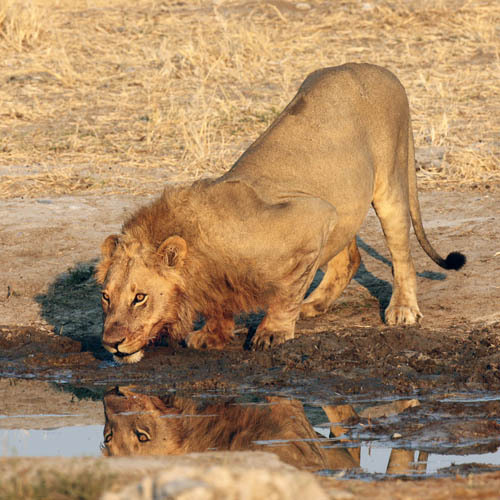 Watching predator behaviour is to be theme of our trip to Northern Botswana on a 9-day mobile camping safari. As well as travelling through stunning scenery and experiencing the variety of environments in three different parks, each day delivers a new piece of action. Two days earlier in Savuti we are watching a lone lioness lying beside the carcass of an eland. She is resting and then wanders over to start feeding again. 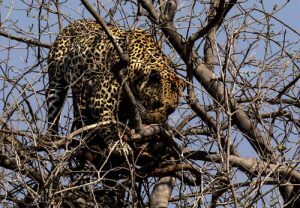 This would normally be the highlight of a game drive until our guide Shadow finishes a chat on the radio and asks “Would you prefer to stay here or go and see leopards mating?” There is little dilemma in this question. Immediately we’re off and 30 minutes later are enormously privileged to see these leopards out in the open and listen in awe to the sounds that are electrifying – I mean this in many senses of the word – the noises are somewhat unreal and send a shiver down my spine. During our nine days there were so many interesting predator sightings, it’s hard to believe how much we witnessed. On reflection, there seemed to be two main groups of activity: kills and feeding and mother and cub behaviour. One article isn’t enough to describe all of these and I can offer only glimpses of the best parts. Our last night in Savuti (on safari it pays to be a light sleeper with one ear open) at around two o’clock I hear the roar of lions and a buffalo in distress. Our morning game drive sees us watching four coalition males with a carcass. The males, four to five years old, are a breakaway from the Marsh Pride. The dominant male shows his superiority by urinating beside one of his “brothers” and in the beautiful morning light walks across the open ground to a pool to drink. It’s captivating; his face stained with blood and a perfect reflection in the still water. 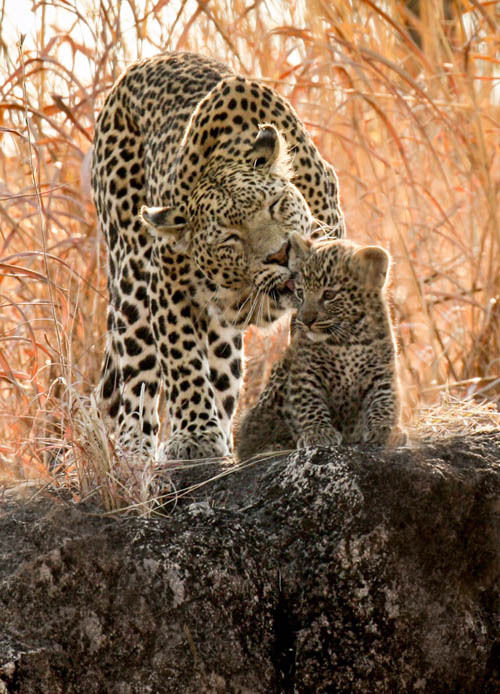 Continuing our drive from Savuti to Khwai, I get my first sighting in 11 years of safari travel of a leopard cub. High up on a rocky outcrop, the car is filled with “aww”…. We are watching a six-week old cub seeming to have the most fun by hiding, running and jumping on his mother’s head and tail. The mother is totally content with the cub bombarding her and continuously nuzzles and licks her baby. More leopard action follows in Khwai with a most interesting game drive watching a male of three years who, whilst he has been independent for some time, returns to stalk and chase his mother, the Machabe female, in some kind of “play”. Cue hissing and leopards running wildly through the bush. The mother runs up a tree, followed by her son. A stalemate is in place for some time, until the male leaves and the female judges it’s safe to come down. As we settle into Khwai we laughingly joke that it’s certainly living up to to Savuti. We’ve already seen a large pack of adult dogs and pups and some fascinating leopard behaviour, but there is more to come. Over two days we watch “Third Bridge Male”. He has killed a warthog and for some strange reason taken it to the top of a Fever Berry tree (strange as there is a rather more suitable tree right beside it). In the tangle of bare branches we watch him feeding and then find him that night, lying on a Sausage Tree branch, full of warthog and sleepy in the sunset. There is some carcass left on the second day, and we scout around to see if he’s still there. Unfortunately we don’t see him hiding in the grass and park the cruiser close beside him, also in between him and the kill. The car is mock charged twice. We sit still as statues – he is all flashing eyes, snarls and teeth. 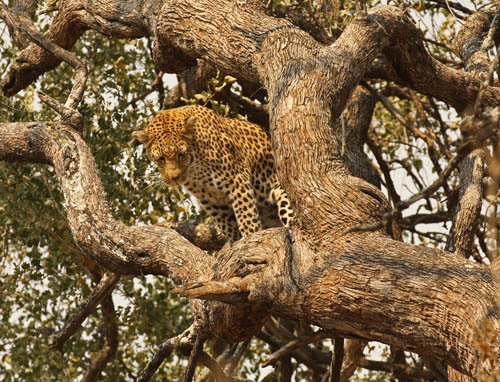 By the third morning he is gone, as is most of the kill, and hyenas are sniffing around the tree. As safaris go, this was simply up there for me as best in terms of action-packed days. On our last night, we toast and thank Shadow – some of this is luck and timing, but there is an awful lot of great guiding to provide this kind of experience. I can’t wish for anything more from the trip… perhaps a fleeting sight of a cheetah? That would be too greedy, and besides, it’s a great reason for a next time. Lesley travelled with Tony McKeith, Busanga Safaris, as group leader. 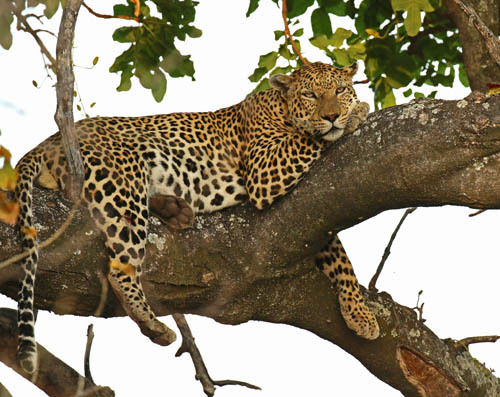 The safari was managed by Botswana-based Letaka Safaris.